There’s an air conditioning vent right above my desk at work and it’s on all the time. There’s something about the location of my cubicle that seems to trap excessive amounts of cold air. I have to wear a light jacket at my desk most of the time. When I go get something from the printer or go to a meeting or something I usually wind up leaving it on. It doesn’t seem to really be very cold anywhere else in the building so I think people just think I’m weird and have some sort of strange attachment to my jacket. I always wear a coat around no matter what, LOL. Well, unless I loan it to someone or it’s snowing. When I first saw the picture, I thought it said something along the lines of.. In other words, he looked really buff..or should I say biff? I too have a jacket that I wear everywhere. People think I’m odd or have some sort of creepy attachment to my jacket. Truth is I just need that many pockets to carry everything I need to. I’m looking at one of those newer cell phones so I don’t have to carry around a day planner, cell phone, mp3 player, and pager. Hey, don’t diss the jackets. Jackets are the definition of AWESOME. I always do that whenever I’m riding in a car with the window down; I just hang one arm out the window. If it’s a loose jacket, I can zip it up all the way and redirect the air flow through my other sleeve to blow on other passengers. 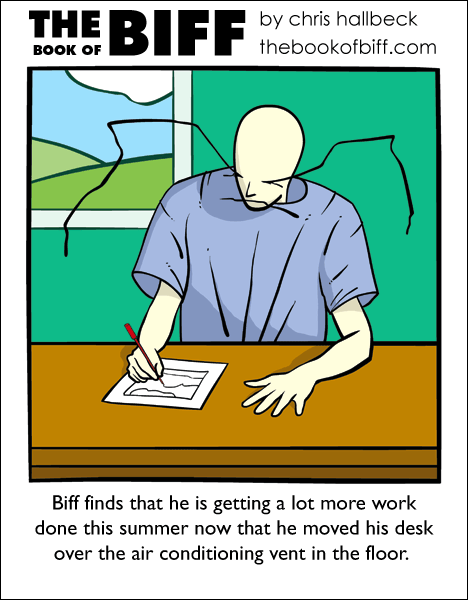 Dragonbrad: doesn’t Biff seem a little “buffed up” to you? Nothin’ like standing over a vent in the summertime…or any time you want to amuse yourself by having your clothes inflate. with that lift it must be a grate air vent to. spots like that shold never be sernderd thay tend to pump hot air thuw when it gets to cold. Does air conditioning cause shrinkage, or is it only cold water that does that? Mmm….That’s what I need for my job. And now for a pun. I guess Biff has a ‘cool’ job now. I like how you made his shirt all huge. You can almost actually picture the air blowing up. Heh, I remember one time standing in a line, there was a floor vent inside the building, and the girl (probably early 20s) behind me had on a dress. Well, I noted that I was on the vent, and casually stepped forward like the line was moving. Without turning around obviously, I checked behind me, and sure enough, the girl had stepped onto the vent and “hadn’t noticed yet” that her dress was about to fly up.. I laughed. Other people laughed, her dad made a joke about Marylin Monroe. i have a soulution! borrow my computer. thing gets so hot, it couters the brand new AC unit we had installed. my room keeps above 70-80, sweaty temps. it all started when i added that gigantic video card and overcloced it. both my board temps and processor temps are above 150F, thats 4 pieces of electronics at burning temps. If all of the old biddies in my office had their way, the heating would be on during the summer. I remember when one of them got access to the thermostat and it was sweltering. When we found out that it wasn’t an AC failure and turned it back down, they were all complaining about how cold it was. AND they all have heaters at their desks. Once they turned up the temperature in the breakroom so high, the chocolate bars in the snack machines were melting. I DO have an attachment to my jacket. It’s basically a wearable leather pocket. I sometimes store extra clothes in it’s lining. i never did the ac vent, but i always did that during the winter…id always sit on the vent and make my shirt billow up…it felt really weird! We have one of those types of vents in our bathroom…It has amused me since I was but a wee mite…. Brilliant! I should do that! But first I need a desk… and a vent in the floor. Once while visiting Hawaii in the summer, I saw a clerk in a store wearing a parka. The owner of the store insisted that the AC always be set to sub-zero. It felt great to all the people coming inside from the heat, but this poor woman working there was freezing. So she wore a parka. In Hawaii. In the summer. It was an odd sight. There’s an air conditioning vent right above my desk at work too…. But someone placed cardboard over some of the vents so now the cold air is redirected outwards, not downwards. Try it. I have that problem with my room, that i can never find the right combination of window open-ness and heating level to keep the temperature comfortable. I usually end up just opening the window wide and putting a jacket or sweater on. I actually do have an air vent under my table! f August, 24/7. It was hot, but hey: I got a nice hundred bucks from it.